Bartacks and Singletrack: here's to turning three! There aren't many birthday's in your life when your mum can convince you to wear a fabric party hat made of leftover scraps! Here's to 3 year olds! hip hip hooray! Two 3 year old thumbs up for the twirl factor, but two 3 year old thumbs down on the colour. I've never seen any ambivalence of attitude in a 3 year old. So on this dress, we'll swing from love to hate depending on the mood. That's the roller coaster we ride at our house. Here's to 3 year olds! sigh, sigh, hooray! But in typical 3 year old just-starting-to -work-out-empathy style I am reassured that "Tinkerbell really likes her new dress, mum. She's delighted with it" Thanks darling. Happy birthday. Happy birthday to A! 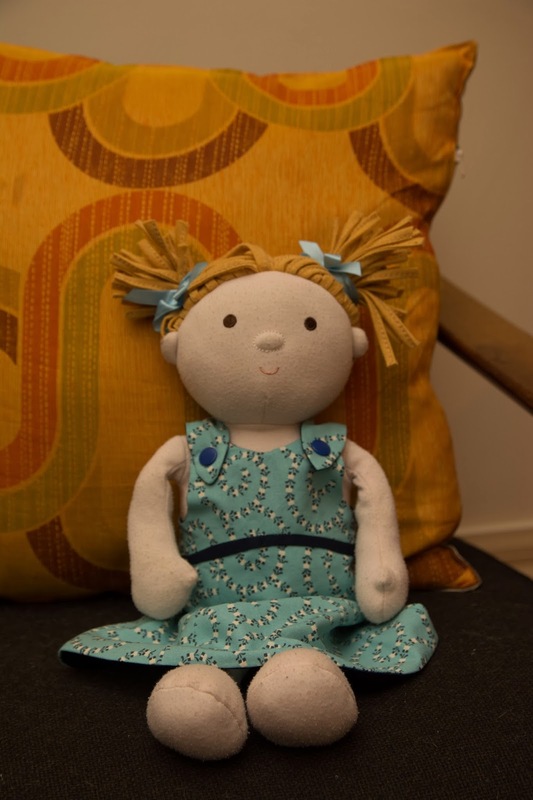 I think a rather cunning plan to make co-ordinating clothes for the doll, and I think the colour rather suits the two of them. Was she hoping for something in pink or purple? Thanks. I thought the matching thing might win her over. It still may... I'm sure pink would have made her much happier. But this was one fabric that I bought (very cheaply on sale) that I had a definite plan for. It kind of had to be the Pinwheel dress. She looks adorable! Happy Birthday sweetheart! I am currently making a Tea Party Dress for a friends daughter who turns 4 on Wednesday and am making up a LTTS Tea Party miniature version to go with as well. I love seeing the big and little versions together on this post, the cute factor is overwhelming! Thank you. She had a great day even though she found it a bit overwhelming at times! look forward to seeing pics of your dresses. Thanks Carolyn. It's pretty big on her so there's plenty of time for her to come around! She looks so sweet in her special birthday dress with matching dolly. 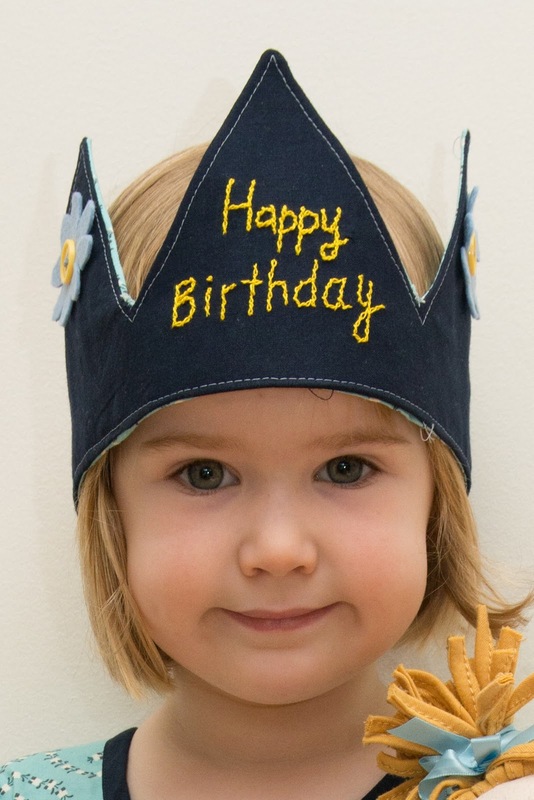 Love the felt crown...making one is on my to-do list. Thanks Deb. If only the crown had been felt. That's a clever idea. I used the leftover fabrics and a really strong bag interfacing. But it was a nightmare to turn right side out and started to tear at the clipped corners hence the topstitching all round. If there's ever a next one, it will be felt! Happy happy 3rd birthday!!! I love the colour! I especially like it paired with the dark trim. I love your description of 3-year old empathy even better. What a cutie! Thanks Irene. I find 2-3 year olds hilarious. She received her first birthday present from us in the morning. Then when my parents arrived for the party my mum presented her with a gift saying "here's a present for you". her reply: "Oh, I've already got one of those"
What a shame she doesn't love the colour. I think it's fab! The whole birthday matching outfits and hats. You outdid yourself. Happy birthday little one! Thank you. I think the twirliness will win her over in the end. It's just too twirly a dress not to love it. Adorable!!!!! The dress looks so festive. I love how it matches the dolls dress. I am just starting to get into the matching doll and daughter clothes. The crown is super cute too. My girl turns 3 at the end of April and I am starting to plan and make things for it. Thanks Christine. good on you for being so prepared! Mine was a few late nights in the week before her birthday. Happy birthday! How did you find the fit on her dress. It's an Oliver & S yes? I think I have this one and remember people mentioning it being quite large. She's been a size 2 with added length in the Oliver + S patterns for so long now. She measured exactly between the two sizes so I went up a size (seemed fitting for a birthday). Nothing more scientific than that. The dress (underneath) is definitely too wide around the chest and probably should have been a size down (back to the size 2T) with this length (3T). The tunic however couldn't really be any smaller across the shoulders. The dress is adorable. I love the swirly print...it's perfect for the Pinwheel dress. You are definitely right about what pattern this fabric was destined to end up as! I love the colour too - it looks so nice on A. What a shame kids grow into people with opinions, likes and dislikes... And aren't afraid to voice them. But at least A was able to make you feel a little better about the doll's dress. That is so cute! At any rate it sounds like A had an enjoyable time - even if she hasn't yet appreciated that it is always better to get lots of presents. So, belated birthday wishes!!! I love this dress you have made, but I can also see your daughter being totally ho hum about the colour. But then that's what three year olds are (and 4, 5, 6 and so on...)In my experience the flounce will help in the long term and you have done such a good job. For the love of bicycles. Secret Valentine Exchange - Happily receiving!